We get inundated every day with incredible amounts of negative clutter. Whether it’s the news, television shows, or the firehose of information on social media, listen to it long enough and you’ll start to believe some pretty glum things. Kids are lazy and unambitious and never do anything but play on their phones. Everyone is more concerned with their own self-interest than the good of the world. Well, if you want to be optimistic about the work ethic of our youth, spend some time at a local junior livestock show. While you’re there, you’ll also learn about the generosity of local communities. The experience might reassure you about the general future of America. Weldon Holbrooks became the vocational agriculture teacher at Stamford in 1955. One of his duties was to organize a livestock show for his students. 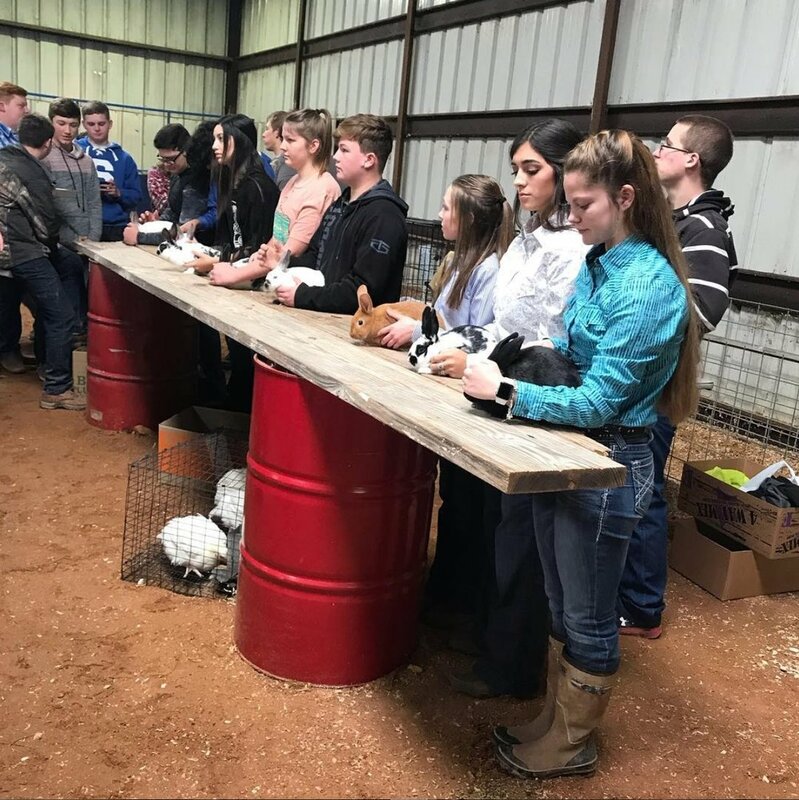 With his vision colored by his experiences as a student and as a teacher elsewhere, Mr. Holbrooks wanted to oversee a stock show that would provide opportunities and rewards for as many students as possible. No matter whether the student’s animal came in first place or last place, that student would get some prize money and not be left out in the cold. If a student had a project but the show did not have a class for that student’s project, Mr. Holbrooks would create a class. Stories abound from years past of students exhibiting traditional cattle, swine, and sheep, but also everything from exotic fowl to purebred dogs. Mr. Holbrooks retired from teaching in 1985, but he supported the show until his death in 2016. Over the years, Lueders-Avoca and Paint Creek schools joined in the show. As a result, the show is now known as the Tri Area Livestock Show. Mr. Holbrooks’ first shows took place outdoors, on the downtown square in Stamford, subject to the whims of West Texas weather. Today, students exhibit their projects in an enclosed show barn. Due to the generosity of the local community, the barn has been improved many times over the years and several years back, Mr. Holbrooks’ legacy was honored when the show board renamed the facility the Weldon Holbrooks Show Arena. Livestock shows take money to operate and Mr. Holbrooks initiated a tradition of mailing a donation letter to supporters each year. Today, that tradition lives on and the show receives donations from $10 to $1000 from a simple letter, with a return envelope enclosed. About 15 years ago, show leadership initiated a cake auction. Held at noon during the show, this event auctions off cakes, pies, cookies, and other goodies baked by supporters of the show and the student exhibitors. The first year raised about $3,000 and all of us were pleased for the supplemental funds. But each year, the cake auction grows into more of an event beyond our wildest dreams. This year, approximately 50 entries were auctioned off for a total of almost $34,000. It’s very easy to be excited about the success of the show and its fundraising, but that doesn’t happen in a vacuum. People don’t give money just for the sake of giving money. People give money because of the mission of the Tri Area Livestock Show and where the money goes. First and foremost, the show is about the kids of Lueders-Avoca, Paint Creek, and Stamford schools. But it’s not just that. Today, Weldon Holbrooks’ legacy lives on. Classes are added and amended each year, depending on the animals that students have to show. Three years ago, an agricultural mechanics division was created to provide more opportunities for more students to show off their talents. But above all, the money goes to all the kids. Grand champions walk away with a nice envelope of prize money, but so do the last place animals in each class. Each students has the opportunity to show and each student will be rewarded for their hard work. If you’ve never spent some time at a local livestock show, I encourage you do to so, whether it be our Tri Area Livestock Show or another one. Better yet, find out how you can get involved in helping better the show’s mission. You just might feel better about your community and the future of America.